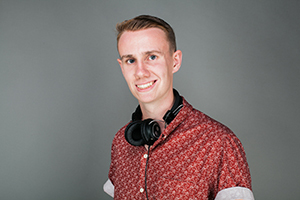 Having moved back to Portsmouth last month to finish my final year at university, I joined the student radio station Pure FM, with the aim of boosting my profile as a DJ and potentially working on a live show as a presenter. A month later, and I’ve managed to make a start with both these goals! I was rewarded with my own live show on Pure FM, which has become known as ‘Luke Myers’ Dance Digest’, and swiftly after the 1st show, I was rewarded with a 6 and a half hour DJ set at the ever popular student union bar ‘The Waterhole’ on it’s busiest night ‘Purple Wednesdays’! With 1000 people coming through the doors, the night was an excellent opportunity to get my name and my mixing out there, and I only had to turn down 1 request for the god awful ‘Gangnam Style’! The set went down incredibly well, and it looks like it will become a regular occurrence! So reminiscing over, back to the radio show! The aim of the show, as Pure FM’s only EDM exclusive show, is to play 2 hours of the finest in new and existing dance music, from a variety of sub-genres (including House, Electro, Techno, Progressive, Dubstep, Drum & Bass, Moombahton & Trap) and from a variety of producers, from up and comers to the big, headline names. Regular features include a weekly ‘Mini Mix’, ‘Producer Showcase’ ‘Album of the Week’, ‘Free Download of the Week’, ‘Single of the Week’ & ‘Extended Play of the Week’. These features will be accompanied by a playlist of some of the finest beats & bass, plenty of plugging of both Soundhall & Soundhall Records along with some good laughs, and good banter! The show goes live EVERY Monday night 8pm – 10pm (UK time) live on Pure FM, and you can tune in wherever you are in the world via the link at the bottom of the page! So, I hope I’ve given you a good insight into what the show is all about, and I hope to see you tuning in over the coming weeks! So, thanks for taking the time to read this, and I hope you’ll be tuning in on Monday nights 8pm-10pm!